Nothin but Honey is the first product from the randy bee range. Beautiful local honey from our own hives. We live in Pine Rivers near Samsonvale Dam and have always dabbled in self sufficiency. Starting out with native bees, the next natural progression was the European Honey Bee. We wanted to extract our own honey and bottle it. We love our bees and we love our honey and we think you will too. They have produced the most natural tasting honey that gets extracted, sieved and bottled. Buy Australian, buy Nothin’ but Honey. Due to quarantine laws we are unable to send honey to WA. 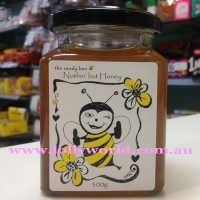 Nothin but Honey is the first product from the randy bee range. Beautiful local honey from our own hives. We live in Pine Rivers near Samsonvale Dam and have always dabbled in self sufficiency. Starting out with native bees, the next natural progression was the European Bee Hive. We wanted to extract our own honey and bottle it without all the processes in between. We love our bees and we love our honey and we think you will too. They have produced the most natural tasting honey that gets extracted, sieved and bottled. Due to quarantine laws we are unable to send honey to WA.